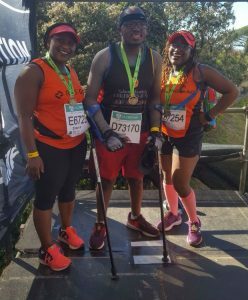 While 31-year-old Ipeleng “Crazy Legs” Khunou is relieved he finished the Two Oceans half marathon on crutches just before the cut-off time, he believes he can do even better. Khunou, the first “crutch runner” to finish the marathon, wowed fellow runners with his tenacity when he pushed to the end. He completed the race in 3h15s. He is looking to finishing the race in under three hours next year. “Forty minutes before the race I couldn’t stand up because I was so nervous,” he tells News24, while en route to his home in Rustenburg. Khunou was born with septo-optic dysplasia, a rare brain deformity. He has to use crutches because he has no balance as a result of the condition. It also affects his eyesight. A few kilometres into the 21km race, he felt calmer and started enjoying the uphill climbs because it was easier to balance. “As we got to the mountain scenery, I struggled because the road was so uneven. From about 13km or 14km, I met up with a man from Gugulethu running club and he helped me deal with the uneven downhill.”new skills. His legs started cramping and he had to stop on the side of the road so a doctor could help. As he reached the finish line, he decided to sprint the last two metres. The move left him with more cramps but absolute relief. With his hands numb, he says he was surprised he could still hold his crutches. His victory was something he could barely have imagined when he started running to lose weight in 2016. “At the time I was seriously overweight, about 120kg. Literally two of me,” he chirps. Khunou ran the race to raise funds for the Nelson Mandela Children’s Fund. After the race, he was inundated with calls from family members. Most proud is his mom Violet. “Most mothers would say ‘don’t do that’ growing up. She says go for it. Khunou says he is extremely grateful to everyone who helped him during the race and also congratulated him afterwards. His Facebook inbox has been overflowing with messages of support and invitations to participate in other races. He has already done a 5km recovery run and will soon be back to a strict schedule that alternates sprints with long-distance running. 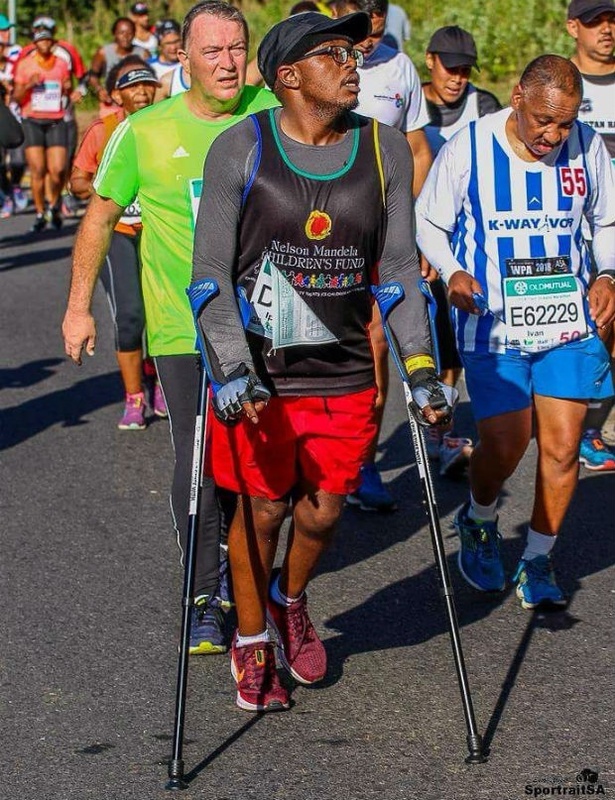 In May, he will join a team of differently abled runners and hand cyclists in a non-stop 24-hour, 10-day, 2 100km journey from Pretoria to Cape Town.